When I was a child, I was really into dinosaurs. (Alright, let’s admit it, I’m still really into dinosaurs). I had stacks of books about them, both fiction and non-fiction. I spent literally hundreds of hours among the crushed-up gravel of our driveway, finding the remains of ancient sea life embedded in the limestone. I even found two large, complete, perfectly fossilized snail shells along the shore of Lake Erie, and to this day they number among my most prized possessions (not dinosaurs, I know, but I’ll take what I can get). There was something about dinosaurs that sparked my imagination, that opened up undreamed-of possibilities, that showed me that I was a bit player in a story far larger than anything I could conceive. For a Young Earth Creationist family, this led to some difficulties. Dinosaurs, you see, lived millions of years ago and went extinct well before the advent of man. 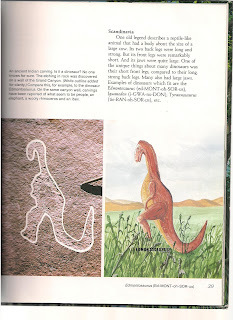 Any dinosaur book worth its salt will tell you this. Some children’s books even went so far as to depict the origins of life – I remember one vivid illustration of a raging sea with thick clouds pouring down rain, a bolt of lightning ripping through the sky, and a caption reading something like ‘Life was sparked in the early ocean by energy, such as that caused by lightning storms.’ It was a powerful, evocative image, completely unlike the cartoony, peaceful six days of creation my Christian children’s books showed me. Here was a real crisis of worldviews. Even at the age of five I could recognize this. Did God create everything, or did a bolt of lightning? Were dinosaurs wiped out by a meteor millions of years ago, or did they live with Adam in the garden? My parents told me to simply skip over those pages dealing with evolution, and only enjoy the dinosaurs. But there was something about that image that had me secretly returning to it and contemplating in awe the imagination of people who would dare defy God. Evolutionary doctrine, then, was working its way into my imagination at a very early age, and not just to me but to countless millions of children the world over who were interested in dinosaurs. Concerned about this, a friend of the family gave me as a gift three books that I to this day still have. One was called ‘Dinosaurs: Those Terrible Lizards’, written by a man whose name I would become quite familiar with later on, Dr. Duane T. Gish, biochemist and graduate from the University of California, Berkeley, former vice-president of Institute for Creation Research and colleague of Henry Morris. The second was ‘What Really Happened to the Dinosaurs?’ by Mark Dinsmore, later rewritten by Answers in Genesis’ very own Ken Ham. 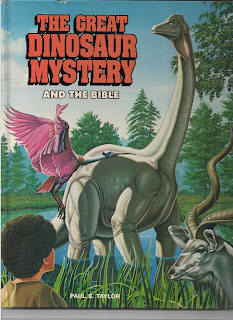 The third was ‘The Great Dinosaur Mystery and the Bible’ by Films for Christ’s Paul S. Taylor. Of the three, it was this third book that would become my childhood favourite. The drawings were more edgy, but it was the stories that blew me away. Stories of people who had seen real live dinosaurs! Like a WWII sub’s encounter with a mosasaur. Tales of pterodactyls seen over the pyramids of Egypt. A legendary encounter between a knight and a ‘dragon’ that could only be a dinosaur. And an amazing, actual photograph taken of a dead plesiosaur being hauled up by a Japanese schooner, along with a Japanese stamp that had been made to commemorate the event. These were not stories I had found in my normal dinosaur books. No, those books told me dinosaurs had died out or evolved into birds. But here I was being told that they were still alive! Why would the scientists lie to me, unless they knew that this somehow undermined their evolutionary tale? 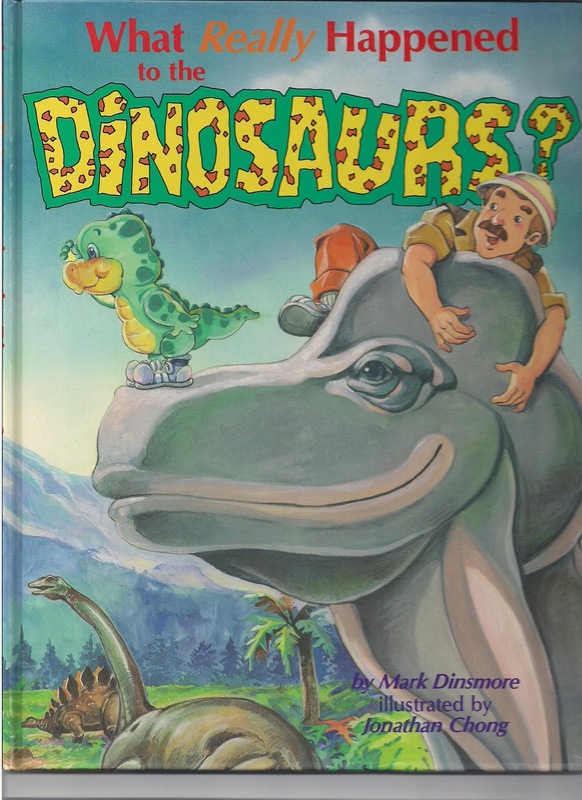 I still read my other dinosaur books, but with a growing sense of scepticism. What kept drawing me back was the photo of the dead plesiosaur. If I remember correctly, the book admitted that some believed it to be a rotting basking shark, but the author immediately dismissed that notion. And with good reason! It didn’t look like no shark! Needless to say, this photo grew within me the conviction that evolution was a lie completely incompatible with God’s word. And thus began my childhood fascination with cryptozoology, the study of organisms that science says should not exist. Cryptozoology is not a Creationist invention; many of the legendary creatures, such as Bigfoot and the chupacabra, are pursued by people who very much believe in evolution and have evolutionary explanations for their existence. It just so happened that some of the cryptozoologists’ passions, like the Loch Ness monster and mokele-mbembe, dovetailed nicely with the Creationist belief that dinosaurs were created by God 6000 years ago, and lived alongside man. Along with OOPARTS (out of place artefacts), cryptozoology is the most common form of fringe science that Young Earth Creationists (and, ironically, New Age movement adherents) employ. 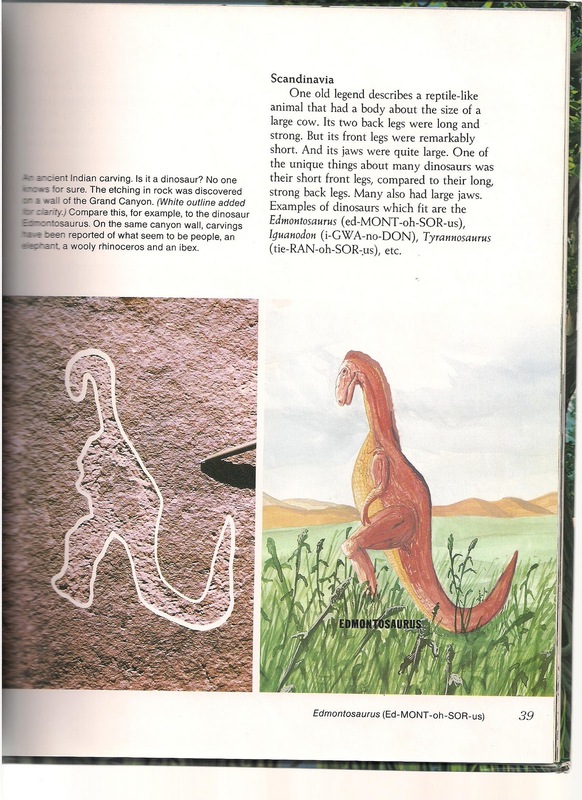 Not every YEC delves into cryptozoology, but you can find some fascinating pro-living dinosaur Creationist sites here and here (scroll to Bible and Science). I did question a lot of the cryptozoology ‘discoveries’, but the discovery of a living coelacanth in 1938, a fish previously known only through fossils, only increased the likelihood that dinosaurs were still alive today. And there was that plesiosaur photo, indisputable proof. Now, after all these years, after circulating through who knows how many houses, after affecting who knows how many children, CMI is affirming what should have been obvious to any adult: the photo is not of a dinosaur. It is a basking shark. What looks like a plesiosaur head and neck in the photo is the rotting caudal peduncle of the shark. If you look closely you can even see that, if the shark’s tail really were a plesiosaur head, the fins would be on backwards. The shark’s head was conveniently off-camera. My impressionable child’s mind hadn’t noticed. This seems like an amazing admission on the part of CMI and (less so, since they list it as ‘doubtful’) AiG. Two of the world’s largest YEC groups rationally rejecting a popular Creationist argument! This is progress, right? Well, before we get too excited about CMI and AiG’s amazing willingness to marginalize certain fringe Creationist groups, we should recognize what they are really saying: that this particular case is definitely (or, in the case of AiG, most likely) not a dinosaur. They are saying nothing about the other claims. Their statement is less radical than it at first appeared. In which we discover what Answers in Genesis really believes about the dinosaurs. All of these quotes come from a video series on AiG’s website, featuring AiG’s charismatic Australian founder, Ken Ham, talking to a large audience of children who appear to be quite young (4 – 10 would be my guess). It has what all kids want – jokes, songs (including, and I’m not joking, the hit single ‘Billions of dead things’), and cartoon dinosaurs. For the rest of this post, I would like to pull out some quotes from Ham’s video and discuss the nature of the YEC logic, and then offer a non-scientific critique on their arguments. The science is certainly strong against Ham, but I will refrain from those arguments, as they abound elsewhere and have honestly never helped in a discussion with a Creationist. Ham and his sidekick Buddy begin with a bang, in the span of seconds constructing a false dichotomy between science and religion (evolution is explaining ‘life without God’), providing an atheistic interpretation of the evolutionary process (‘random’), stating that God could not have created through the evolutionary process (‘I believe that God created everything’), and completely misconstruing the point of the Bible by calling it the ‘history book of the universe’. You will notice a change here from traditional Young Earth Creationist arguments. They are moving away from calling the Bible a science book or a book that contains science. Instead, it contains history, and we can use that history as an interpretive framework for looking at the sciences. Science, this argument goes, is interpretatively neutral; we impose our worldview onto it. The atheist sees in the evidence godless evolution because that is how they are conditioned; the Christian, who has received revelation from God, has a God-given framework that allows him to see in science the evidence for creation. The atheistic framework causes them to misconstrue or overlook evidence; the Christian framework allows us to see things as they really are. Thus the Flood is an historic event, but its scientific reality can be seen in the discoveries of science, if you know how to look. Do you agree? Whether you believe in the authority of the Bible as God’s revealed word or not, do you think its primary purpose was to be a history book of the universe? This is clearly a topic for a future post. But needless to say, I think calling the Bible a history book of the universe is getting into some very dangerous ground. The future is not bleak, but is filled with hope. These first four statements especially (and the fifth to some degree) certainly contradict virtually everything that is believed within the scientific community. But by linking them with Jesus’ death and resurrection, Ham is in effect saying that, by providing evidence that creatures died before Adam, or that a global Flood did not happen, or that the races of man have numerous and diverse origins, you are denying the gospel message of Christ. This is a pernicious argument. This quote does not get across the chilling nature of the video. Every question he asked was answered by hundreds of children yelling out ‘No’ or ‘God’. This is by far my biggest pet peeve with the church – spreading lies and misinformation to children who implicitly trust their parents and whose minds can be easily swayed by funny costumes and the appearance of compassion. At any rate, you should be starting to get a picture of the YEC position on the dinosaurs: that God made them on the same day as Adam, 6000 years ago. Millions of years, indeed! As proof that dinosaurs did not evolve, Ham provides evidence for their appearance in Scripture. The word ‘dinosaur’ is of course found nowhere in scripture; as Ham points out, it was coined by Richard Owen in 1841, whereas the KJV was translated in 1611. But we do find the Hebrew word tanniyn (which I talked about in my Chaos and the Deep article), which the KJV defines as ‘dragon’. Completely ignoring any mythological complexity to this term, Ham identifies these dragons as dinosaurs. The Leviathan of Psalm 74? A plesiosaur. The ‘flying serpent’ of Isaiah 30:6? Could be a pteranodon! 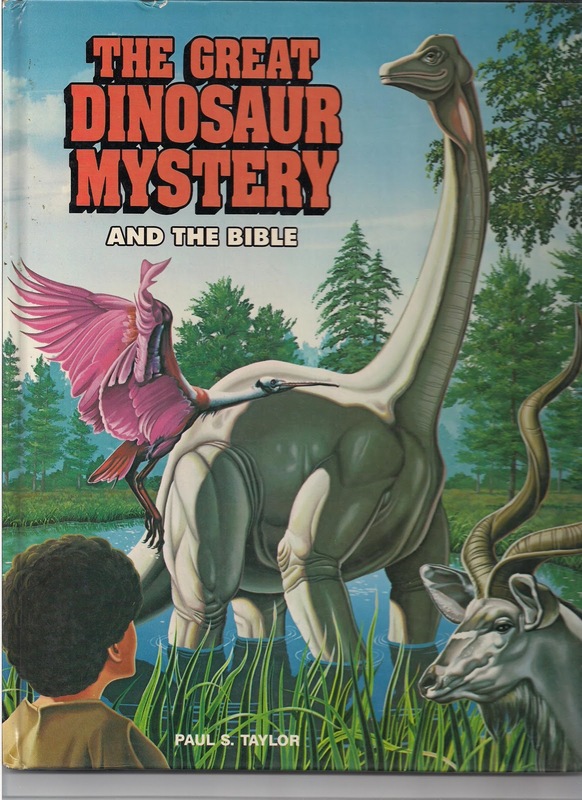 ‘Is there any specific reference to a dinosaur in the Bible? I think there is. Job 40:15.’ The behemoth and the leviathan. Job is a very lengthy book about suffering. It begins with a common folk tale: God allows Satan to destroy all of Job’s family, wealth, and health, because Satan believed that Job’s righteousness was only due to his possessions. Make him a beggar, Satan thought, and Job would curse God. The folk tale ends with Job’s integrity being affirmed, and God blessing Job with incredible abundance. In between this narrative is a lengthy (40 chapter) Hebrew poem, composed as a debate between Job and his friends on the nature of suffering. His friends try to help by accusing him of various sins, believing that if they confront Job with his vileness, he would be willing to confess and be restored back to God. They were operating under a common understanding of the blessings and curses in the Pentateuch and Proverbs: that a righteous man receives his reward in the present life, while God brings down the wicked. Job, therefore, must be wicked. Job is anything but patient, regardless of the cliché. Instead he is loud, arrogant, blasphemous, as he accuses God of all sorts of mistreatments and injustices. He refuses to acknowledge any sin, which only reinforces his friends' ideas. But we the audience know that Job, despite going against a common interpretation of the standard dogma, is in fact correct: he is innocent. His suffering really is underserved. But we can’t help but cringe at some of the things Job says, wondering how God will respond. Finally God does respond to Job’s repeated pleas for a face-to-face encounter. He arrives in a whirlwind. But rather than explain everything that we the audience already know, God instead hammers Job with a series of questions. He begins by discussing the creation of the world, asking Job if he has any experience with the hidden parts of nature. No? Oh, I’m sorry, from the way you were talking I thought you knew more than God. He then brags to Job about the wastelands and the wild animals that refuse domestication. With each question he is opening Job’s mind up to a larger reality, revealing that there is more to the workings of the world, and more that is on the mind of God, than a single man. After Job gives a pitiful response in his own defence, God unleashes the most eloquent of the speeches, dealing with the behemoth and the leviathan. This is God’s last speech to Job, and when he is done, somehow Job has understood the folly of his thoughts and acknowledges the greatness of God. How? How do we get from talking about giant creatures to a satisfied Job? The guy lost everything; if these creatures were dinosaurs, animals like the lion and the donkey that Job saw every day, how could this possibly be enough to convince Job to lay off? As I have suggested elsewhere, the behemoth and the leviathan were never meant to be taken as literal animals. They were embodiments of that image of chaos, fierce creatures that all man fear, the chaos that threatens order yet persists as part of God’s created realm. Job’s satisfaction came about by God’s opening his mind to ever greater realms, from the deep of the ocean and the stars in the sky, to the barren desert and the behaviour of wild animals, and finally to the chaos that threatens all of it. God revealed to Job that he had not forgotten about the forces that cause suffering, but that they were at the forefront of God’s mind and, next to the power of God, were not as terrifying as they at first appeared. That is Gibson’s interpretation of this strange speech, and it is about the best I have yet to hear. It certainly is more powerful than the standard interpretation of the behemoth being the hippo or elephant, and the leviathan being a crocodile. But it also makes more sense than God randomly talking about dinosaurs, for no reason at all. (As an aside, a common argument that behemoth must be a dinosaur is the description of its tail ‘like a cedar’ – which is certainly not the tail of an elephant or hippo. But some scholars note that this could be a euphemism for another massive tree-like organ that represents virility. Indeed, the ‘sinews of his thighs’ is translated as ‘stones’ in the KJV, which then would refer to his testicles. Even if this is incorrect, though, it is a pretty big leap to go from, ‘It has a big tail’ to ‘Job saw a dinosaur’). At any rate, you can read a pro-dinosaur commentary on the passage here. This is where things get really weird. Start this video at the nine-minute mark. Ham claims that his pal Buddy had found an actual fire-breathing lizard out in South America. Buddy brings out a cloth, and hidden within it is the supposed lizard. He removes the cloth and, sure enough, although it is hard to see, there is what appears to be a lizard in his hand, snout raised in the air. Suddenly there is a burst of flames coming from the lizard’s mouth, and rapidly Buddy covers it with the cloth and takes it off stage, never to be seen or mentioned again. The camera focuses on the shocked face of a little boy. Was this supposed to be a joke? I can’t figure it out – if anyone else knows, please tell me! There is definitely no such thing as a fire-breathing lizard, so why are they trying to convince the kids that there is? If Ham was using it as a gimmick, he should have at least told the kids this after. But he doesn’t. He offers it as proof that fire-breathing lizards exist. They do not. This bears repeating – there is no such thing as a fire-breathing lizard. b) What happened to them if they aren’t? As for question b), that’s a little more complicated. The first part of the story of the history of the universe, as told by Ham, was that God made a perfect world. In this perfect world there was no pain, no suffering, and above all, no death. In Genesis 1:29-30, every living thing is given the plants to eat. There was no carnivory. The carnivores and parasites that we see today were a direct result of sin: ‘It’s possible even God changed some of the animals in some way we don’t even understand today.’ The T. rex, then ate fruit. I do not want to get into death and sin today, that is a big topic for the future, but suffice it to say that there are really great theological reasons for supposing that the link between sin and death has nothing to do with physical death (and, of course, there are scientific reasons - cancer-ridden dinosaurs, dinosaurs locked in battle, the mere existence of fossils). Probably the easiest argument for the time being is that, in perfection, all animals were allowed to eat fruit. Unless you are willing to deny plants status as ‘living things’ (and some people do this, saying that to the Hebrew people life was in the blood – which, for a Creationist who takes God’s Word as inerrant, is a pretty bold statement to make, since it accommodates God’s message to the understanding of the Hebrew people, something they are unwilling to accept for Genesis 1) then of course there was death, even in the midst of this perfection. Plants are amazingly dynamic living things, with the ability to respond to their environment and, in many cases, communicate to neighbouring related and unrelated species through chemical signals. For Adam to digest a plant, he had to kill some cells. And of course if there were no death, God’s creation would not stay perfect for long – with a doubling time of 40 minutes, E. coli alone would have overrun the world in a matter of days. Taking the Genesis 1 passage this literally is simply untenable. As I have suggested before, there must be another way of reading this. 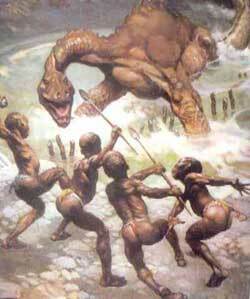 At any rate, the fossil record clearly shows death, but the YEC do not accept that this occurred before the fall. The fossil record must be relatively young. The majority of dinosaurs must have died during the Flood. The YEC position is that dinosaurs lived with Adam in Eden, that they were herbivorous, and that after Adam sinned death entered the world and left its indelible mark on nature. And God punished this sin through a worldwide Flood, resulting in the deaths of all but two of every animal (and seven of some) which were saved by the ark. Again, I will get into this in more detail in the future. For today’s topic, though, let us focus on the dinosaurs, and the common YEC question: did Noah put dinosaurs on the ark? The YEC answer is a resounding yes. 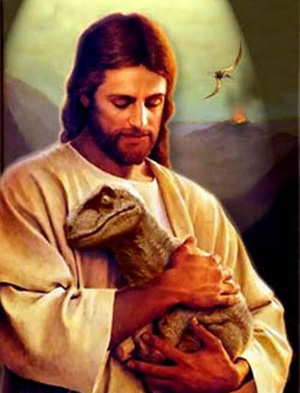 If God had arranged to save all of the animals from a Flood, this would have included the dinosaurs. But how could a boat fit them all? Dinosaurs were huge! Not to mention all of the other creatures. Ham reminds us that dinosaurs weren’t that big. Some were, but babies weren’t. God could have sent baby dinosaurs to join Noah on the ark. Furthermore, the Bible doesn’t say that every species went, rather every kind. I might as well introduce this topic now, as it will come up again in future postings. Baraminology is a relatively recent introduction to the YEC lexicon. Bara is Hebrew for ‘created’, and min is Hebrew for ‘kind’. Therefore it is the study of ‘created kinds’. The basic idea is that the evolution of related organisms at, say, the genus or family level is indisputable. The evidence for adaptive radiations, the rapid evolution of a few species into many (for example, the numerous species of cichlids in the African rift lakes) is well established, and we all know that dog breeds are descended from a single wolf species. Many Creationists have accommodated this evidence by saying that God did not make each species but rather, as stated in Genesis 1, he created each kind. This kind would relate to say the family-level in the Linnaean system of classification. In the flood account this phrase kind is used again. So, argues Ham, God did not save all 600 known species of dinosaurs, he only saved a representative of each kind, numbering at 16 000 individuals total. That is 16 000 individual animals, not dinosaurs. The genetic problems with this boggle the mind, but that will be for a future post. So most of the dinosaurs died in the Flood, but some survived to hang out with Job. But then what happened? Although God went to the trouble to save them and allowed them to rapidly speciate after the Flood, the post-Flood environment was too inhospitable for most of the dinosaurs, and they simply went extinct. Like every other extinct creature. Ham finishes his presentation by bringing everything back to Jesus. I have little to say about this that I haven’t already said. But basically he implies that, if you deny a worldwide Flood, if you believe in millions of years and evolution and pre-human death, then you are invalidating the gospel of Christ. That is a bold claim. It would mean that I, while writing this blog, am one of the antichrists that the New Testament warns about. A false teacher. A wolf in sheep’s clothing. In the end, I have to leave it to you to decide. Does anything about the YEC position ring true? I say, no. As an evangelical, we do not have to keep the Creationist baggage. We should be accessing the truth in all areas, not surpressing it. We should be engaging in discovery, not neglecting it. Unfortunately, it is my view that what Young Earth Creationism has to offer is painfully inept. I know some of you reading this belong to that position, and I do not mean to offend. As someone who was once a YEC, I do not wish to destroy your faith, only to open you up to a new way of looking at this amazing world that God has created. But with over one million people having visited Answers in Genesis' creation museum since 2007, I have a lot of catching up to do. Answers in Genesis recognized that the plesiousaur was probably not a real dinosaur, but they were unwilling to put that in their 'arguments definitely not to use' category. Why? Why not just admit that it is a basking shark and be done with it? Considering that in 2002 they brought in over $11 million dollars, and that in 2007 they were able to raise through private donations $27 million, and given that a recent Gallup poll suggests that 40% of Americans identify with the Young Earth position, I think the answer is obvious: like all multi-million dollar organizations, their main concern is the bottom line. Dinosaurs sell. Why marginalize potential customers, when dinosaurs could possibly still exist? After all, we haven't searched every part of the globe for them. So long as people are willing to pay, I have a feeling dinosaur-inspired interpretations of the Bible will persist for years to come. Jesus holding the dinosaur was made by Monty Propps, but I can't find its original posting anywhere. Matthew, thanks for relating how this young earth/old earth debate influenced you and many other children.